On the evening of April 15 1994 I arrived back in Worcester from working in Birmingham, to be told that the City water supply was contaminated. The initial advice was that it should not be used for drinking, cooking or washing. The following day, instructions were that it could be used for washing and washing dishes, and by 17 April it could be used normally. Bowsers were brought into the city on the evening of 15 April, and people queued for water. Others, co-ordinated by local radio, ferried water to the aged and infirm. The cause was a quantity of chemicals which had entered the river at Wem in Shropshire, and had only been detected when a number of users at Worcester complained of the taste and smell. All this brought the water supply (so often taken for granted) very much into people's minds. It gave me the incentive to write up what follows, based on earlier research. Subsequently Severn Trent Water gave each household a cheque for £25 for the inconvenience caused. From early times , the people of Worcester obtained their water from wells which were common in what is now the High Street area. The Blackfriars excavations revealed wells of many periods, including Roman. The first piped supply is said to have been to the monastery from Prior's Park in Battenhall, using wood and lead pipes, during the 1400's. The knowledge and effort needed for this kind of operation must have been backed by strong motivation. The monastery then tried a similar operation from a spring called Swanpool in St John's, and then from another spring known as Holy Well, also in St John's. The latter was to be the most lasting arrangement. The water was piped across the old Worcester bridge to the monastery. In return the St John's tolls made to the Cathedral were given to the city. The pipes across the bridge remained until the civil wars, when they were believed to have been used to cast bullets. The bathing troughs in the Cathedral cloisters, into which this water ran, may be seen today. Four hundred years after the monks began to use the Holy Well Spring, water from it was being sold to the public at 0.5d a bottle, as it was thought superior for making tea. In 1847 surveyor Henry Austin had the water from this spring tested, believing that monks always knew a good thing. He found it preferable to city well water, but "for domestic and lavatory purposes not as good as the more readily obtained river water. There had, however, been many developments during these four hundred years. The river itself, with its varying influence on the siting, development and life of the city, is one factor which remains constant throughout the period covered in this study, from early times to the present day. Another factor running through the whole period is the community's need for water to enable life. Around this second factor cluster many issues; advances in technical knowledge, awareness of health issues in relation to water, growth in social understanding and in municipal readiness to identify, fund and supply needs, the development of local government and the changing definition of what constituted an acceptable standard of life for society generally. In the 1500's we know of three communal wells in Central Worcester: by All Saints Church, in Pump Street and in what is now the Shambles. In 1599/1600 there were moves to encourage a project for piping water from the countryside to four points within the city, but the scheme was dropped, probably because of cost. It is probable that pollution in the central area of the City was already causing problems, also that demand was increasing. The river continued to be a source, and in 1608 the Chamber Order Book of the City recorded £5 given to the parishioners of St Peter's for making a causeway and quay near the castle "to have passage for water and other necessary uses". In 1612 we read in the Chamber Order Book that two wells in St Martin's ward were to be made into pumps, "and that the whole ward shall be assessed therefore". Shared amenities under municipal responsibility meant shared payment. We are at this period seeing early development of this, and of repeated evidence of concern about the water situation. Out of this concern came the first scheme for a "water works in Worcester. The year was 1619. In a Chamber meeting on 2nd July, the scheme was under discussion. Water was to be conveyed from the river at the bridge to a cistern at the "Grass Cross" and another at the Tolsey. Those undertaking this work were to receive £200. Worcester's senior "local government", the Company of the Twenty-four, would lend £100 on security, and their less senior colleagues, the Company of the Forty-eight, would lend another £100, on security, both until the feast of All Saints in 1620. On 22nd October 1619 it was agreed that Mr John Huntley of Gloucester was to lease a plot of ground at the quay to build a water works, to convey river water "into the severall streets of the said cittie".. After two years of the lease, there would be 40 shillings per annum rent payable. The scheme appears to have been completed by 1623, when it was said that larger cisterns were needed, and in 1623 also there was concern over pollution of the river from the work of dyers. In 1635 the lease changed hands. A new lease was made to Mr Morton and Mr Trotman for a hundred years at 40/- per annum. The arrears of Mr Huntley's rent and the several sums of £100 to become due were to be remitted. (Clearly the operation had not paid its way: the works were ruinous.) The Town Clerk was to prepare an act for the next chamber, for the "ordering and better governing" of the waterworks. 1. The waterworks were in "greate decaie". 2. Nobody without a current agreement to do so should, after the next St John the Baptist's day, take water into his house, court or garden without a licence, and everyone was to pay rent: penalty for contravention - 20 shillings. 3. Every water user should have a pipe fitted by which he obtained water to his own premises. The diameter of this pipe should be measured by certain named members of the Council. Rent would be assessed in relation to the size, which could not subsequently be altered without the agreement of the "undertakers" of the waterworks. Penalty for contravention - 10 shillings. 4. Nobody taking in water was to permit it to be wasted. Penalty for contravention - 5 shillings. 5. Nobody receiving the water was to sell or dispose of it to another citizen unless it was to someone who paid rent for a supply to their own house and who was hindered by the undertakers from receiving it. Otherwise - penalty of 5 shillings. All fines were to be paid as half the amount to the poor of the parish in which the offence was committed and the other half to the undertakers and their assignees. 6. In the event of the supply failing, named members of the Council should apportion the rent of users for such time as the supply failed if it was by "defect of the work" and not through frost, drought or any other ill accident which the undertakers could not prevent, and not through any fault of the user. The Mayor and Aldermen were to arbitrate in disputes. This act seems to show a high degree of organisation and social responsibility, but it seems not to have worked quite like this in actuality. By 1637 the new lessees had again failed to pay their rent (December 1637), and between June 1637 and April 1638 plague raged in Worcester, and 1551 out of a population of 7000— 8000 are said to have died. In 1641 it had been decided that 6/8d yearly should be paid to John Folliott, a pumpmaker, for keeping the water engine ready and serviceable upon all necessary occasions. It was clearly necessary to regularise the basis on which pumping of water would take place, and one may wonder how haphazard it had been prior to this. It seems that later in the seventeenth century the waterworks may have been moved to an island beneath the bridge. The 1651 map of the City of Worcester "as it stood fortified" shows the "Water House" at the Quay area as a tower forming part of the city fortifications. Hard winters in the 1680's caused damage to the bridge due to ice floes: the waterworks on an island under the bridge was damaged in 1688, pulled down and rebuilt in 1692. (D. Whitehead: John Gwynn and the Building of Worcester Bridge; Trans Worcs Arch Soc Vol 8 1982.) In February 1689, perhaps as part of this redevelopment, the Corporation granted a lease of the waterworks to John Hadley of West Bromwich, with powers to break up the streets to lay pipes, and erect over the Cross a cistern holding 200 hogsheads of water. A document in Worcester Record Office, dated 16th February 1778, assigns the lease of these works to the Trustees for building the new bridge (who needed the land for the bridge site). It quotes extensively the original 1689 lease, defining a piece of land "adjoining the river between the house then in possession of Richard Carwardine and that of the widow ?Pearkis? commonly called the Cranehouse". This land was 13 yards on the widow's side, 10 on Carwardine's, 12 on the river and 12 opposite. The lease also granted "liberty to erect, build etc.. in the said river and upon 12 yards square thereof against the said parcel of land all such engines, waterworks and buildings as to him, John Hadley, his executors, administrators etc.. seem meet .... and to extend the foundations five yards down the said river if they saw cause .... but cause not any damage to the navigation of the river and keep a "wear, dam or stank" from the lower end of the Engine's waterworks up to that part of the Bridge whereon the Tower or Gatehouse then stood, so that the same wear, dam or stank extended not further than the old wear then did, and other liberties .... to John Hadley, executors etc. for 500 years at the yearly rent of 40 shillings and two good capons to the Mayor". We have a number of prints (see illustrations accompanying this study) which may illustrate the island in some form. Buck's print "South West Prospect of the City of Worcester", dated 1732, shows the waterworks on what appears to be a spit of land near the site of the present bridge. Doharty's map (1741) shows the site of the waterworks near the present bridge, an apparent spit of land and a channel "The Little Severn". In 1764 Green's "Survey of the City of Worcester" referred to the water engine at the conflux of Little Severn with the main river near the quay. "An invention of great utility to the inhabitants of the city, by conveying soft water to its remotest parts." One feels that in view of later more detailed accounts of the efficacy of the service, this must be an optimistic view of the facts on Green's part. Richard Broad's plan of the City of Worcester shows the old waterworks in the area of the present bridge (illustrated in David Whitehead's The Book of Worcester, 1976). Eaton in his History of Worcester refers to the clearing away of the islet near the new bridge site, pre 1770, in preparation for the building of the new bridge and its approaches (Bridge Street, the previous bridge had led into Newport Street). (See reference to transfer of lease, above.) On July 9 1767 the Worcester Journal had advertised the waterworks of the city to be let or sold, together with a dwelling-house, garden, outbuilding, corn-mill and blade-mill (these could be converted to other uses of a waterwheel). The part of the waterworks which was for the service of the city brought in upwards of £120 per annum. It seemed then that the waterworks had, after its earlier difficulties, become a lucrative proposition: but there may have been no takers, as the advertisement reappeared on 29th December 1768, omitting the last sentence, referring to how much it brought in. Directly above this advertisement in December 1768 was one for plans and estimates for the new bridge "at or near the place where the present bridge stands". In fact there was prolonged argument over whether the new bridge should be on the previously existing site or elsewhere — the choice of the crossing to the new Bridge Street made it necessary that the existing waterworks should be moved, though Eaton writes that the works on the river were removed and the islet cleared away to improve the navigation of the river. He adds "The small island still remaining there was formed when the water-works were erected." In 1770 appeared the Act for Better Supplying the City of Worcester and the Liberties thereof with water and for better paving and lighting the said city. Landlords or owners were to lay, place and repair branch pipes, break up the pavements and make them good. No present or future waterworks or reservoir was to be rated or assessed for or towards land-tax, church or poor rate. There were arguments in the nineteenth century because Barbourne works were rated to Droitwich Poor Law area. At around this time the water works were moved to the water tower in Barbourne, about a quarter of a mile north of Pitchcroft, at a cost of £11,000. The water was raised by a water wheel, and the city was supplied by pipes. There are said to be wooden pipes still to be seen in the store of Worcester City Museum: I imagine these may date from this time, when wooden pipes were laid down Foregate Street. 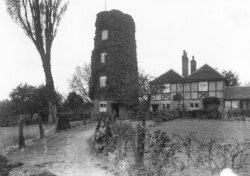 The tower was at the junction of the Barbourne Brook with the Severn and it remained there until this century, having been converted into a house. (A postcard of this accompanies this work.) The Worcester Record office has a map of land published for use of the waterworks "lower Reach of Barbourne Brook and New Cut for Waterworks" drawn by G Young in 1774. Water taken from this point would have been cleaner than that taken from the Quay area, but the system must have had drawbacks, because in September 1807 the Commissioners agreed to erect a seven horse power engine in Owner Featherstone's yard at the South End of Pitchcroft (a little North of Upper Quay) and that cast iron pipes should be laid to the reservoir in the Trinity. Among tenders agreed was one from Mr Reading, 781 yards of Iron Pipes at 21/-, £820.00. Mr Robarts, one of Worcester's MPs, had the engine erected at his expense. The engine, which cost £780/15/0, proved unsatisfactory, and was reported on in 1809 and needed repair and alteration. In 1817 the reservoir in the Trinity, being unfit for service, was sold by auction, and replaced by a cast iron tank costing £110. In 1823 the Act for Better Supplying the City of Worcester and the Liberties thereof with Water was given Royal Assent. This had been preceded by some anxiety in the city over likely expense. The Record Office has a petition of 1821 or 1822 from St Peter's Parish to the House of Commons. St Peter's Parish was part in the City area and part in the County: the latter had the higher poor rate, and if the new Act went through, would in some degree be subject to its operation- they did not want water pipes or expense. "The inhabitants of that part of the said Parish of St Peter which lies in the County of Worcester humbly beg leave to state that they consider water, watchmen and lamps quite unnecessary for their comfort and convenience, and they do not at all feel the want of them, but should lamps at any time be deemed requisite your petitioners would be able to erect them by public subscription or otherwise at a far less expense than under the provisions of the said intended Act... A note (dated 17 March 1823) in the box with this document reads "There are no lamps in the City of Worcester except where the main water pipe is within 30 yards" and refers to a clause to enable the Commissioners to make a rate on these houses not exceeding 6d in the £, and that watchmen were to be employed in the City of Worcester as the parishioners may direct, and rates made for that purpose. Also at this time, a "mini-census" of occupied houses in the various wards was taken, evidently with a view to assessing lighting and possible increased rating. The era of developing local enterprise, municipal responsibility and cost was now well and truly dawned. The nineteenth century was to see major developments in the history of water supply. This Act created and defined Commissioners as being those persons who occupied property within the city and enjoyed rents of £60 p.a., or were possessed of £1000. (This was an attempted enforcement of municipal responsibility for the more well-to-do citizens.) The waterworks, engine, reservoir, buildings, pipes etc. became by this Act the property of the Commissioners thereby appointed, who were given the right to buy houses if needed for making new works, to break up the soil, and so on. Owners of houses were required to lay, place and repair branch pipes. Water rates were to be borne by tenants (except where the value of the house was under £4 rental p.a. ), where the house was within 30 yards of a main water pipe and wherein Severn water shall be conveyed - the rate to be not more than 2 shillings in the £ in any year. In 1830 Eaton's map in his Concise History shows the site of the waterworks on the Quay, at the edge of the Racecourse: around this time too it seems that a new pump was acquired and part of the mains replaced. In this epidemic there were said to be "only" 79 deaths out of 293 cases of cholera. A letter in the Record Office from Dr Robert Streeton, Honorary Secretary of the Board of Health, urges the Commissioners that the water engine should work six days in the week during the prevalence of the epidemic: should this not be practicable, it was important that Saturday should be one of the days when it worked, as the supply of water on that day was very much required. Sewerage in the City, as will be seen later, was virtually non-existent. There is a sadness in looking back with hindsight on history. In 1844 the construction of Diglis Weir and locks of the river raised its level permanently by almost 3m. Prior to this Worcester was technically the highest point up river to be affected by the tides, a rise of 0.5m at springs. Yet the river was navigable for only four months of the year ("The Site of Worcester: its Geology and Geomorphology" by L Morris, in "Worcester and its Region: Field Studies in the former County of Worcester: ed. B H Adlam, 1974.) Instrumental in this river development (carried out in the teeth of opposition from Gloucester) was Edward Leader Williams. He was born at Reading and educated at what is now the Boys' Grammar School. He was clearly gifted, but as a dissenter was not able to go to University. Apart from his work on the river, for which he was elected a Member of the Institution of Civil Engineers and awarded a Telford Medal, he won a competition for plans to widen Worcester Bridge - but began his career as an ironmonger in Worcester on what is now the site of the Guildhall, and was Councillor for All Saints Ward from about 1837. He became the River Board Surveyor and was in 1849 to resign from the Council on his election as first Surveyor under the Public Health Act. In this latter capacity he was to become the leading figure in the history of Worcester's water supply until his resignation from that office in 1853. His lecture on the subject of water supplies, given at the Natural History Room in Foregate Street (see later), reported in the Worcester Journal, reveals an intelligent and widely read man of extensive interests and ability. He was to remain River Board Surveyor until his death in 1879. He was the father of 11 children: amongst whom were Edward, later to be knighted as Designer of the Manchester Ship Canal, and Benjamin, to become famous as Benjamin Williams Leader, the successful Victorian artist. In 1847 appeared the first of a series of reports commissioned around the Public Health Act: the report of Henry Austin on the "Sanatory (sic) Condition of the City of Worcester", which had been requested by the City Commissioners at their meeting in October 1846. There were more than 700 houses in the city uninhabited. The city had virtually no sewerage, until almost this period there had been only one short sewer, in Bridge Street, which could drain the basement floors of houses. The surface drains were shallow and not effective. In some High Street houses the necessaries are in the cellars, and refuse had to be pumped up. There was also a line of main sewer between Lowesmoor Canal Basin through the Blockhouse and Diglis to the river. But this sewer was laid out in a piecemeal way. Austin explained that water was currently from the waterworks and from wells. Water from the mains was laid on to the ground floors of houses in different districts twice a week. On sampling, the city well water was found to be undesirably hard. There was a need for a properly planned system of impermeable sewers and for legislative powers to enable such work to be done. He advised that preparations should be made prior to the passing of the Public Health Act. He also advocated the use of water closets, not "a complication of cranks and wires, but cheap, simple, durable, strong and self-acting": he had designed such an apparatus himself, and he does not omit to give the name and address of the manufacturer! Austin's estimated costs were: waterworks £21,000; sewerage £30,000: sewerage disposal £23,000, which, after revenue and expenses would arguably leave an annual revenue to the city of between £2000 and £3000. He believed that in towns of average size, a rate of 3d to 4d per house per week for poorer tenants, and 4d to 6d for the better off, would be fair remuneration for providing and maintaining drainage and water supply, abolishing cesspools and providing water closets. In an appendix to the above, Edwin Chadwick notes that the average age of death in Worcester was 33 years and 4 months, and that 21 children out of 100 in the city died within their first year. He argues, in purely mercenary terms, that constant pure water would be cheaper than the current costs of sickness and premature death. 1847/8 was the year of the Public Health Act. Twenty years later, Noake was to write in his "Guide to Worcestershire" that agricultural and gloving distress and the cost of erecting a new gaol and Shirehall were as a trifle compared with the agitation consequent upon the application of the Public Health Act, the sanitary question, and the "long-remembered 'little bill' of the engineer of that day (this being Edward Leader Williams mentioned above, and of whom and his 'little bill' more later.) Petitions in favour of the Act were forwarded from Worcester, one of which bore 700 signatures "of the working classes". (Turberville "Worcestershire in the Nineteenth Century, 1852). At the first public meeting, on 19th April 1847, it was decided by a close division in favour of the Government bill. The Commissioners were very much opposed to it, as it brought their authority to an end. Cost and centralisation were the main arguments brought forward against it: (Mr Pierpoint, speaking against it, worked a puppet on a string to demonstrate what the Town Council would be in the hands of the Central Board of Health.) Following this meeting, the Council adopted a petition in favour of the measure. In May a petition in favour of the Act was presented from Worcester, signed by the Dean, most of the clergy and all the doctors. The bill was "committed" in June by a good majority, but did not become law owing to a general election. Dr (later to be Sir Charles) Hastings, in supporting the nomination of a candidate, said that he would not vote for any man who would not pledge himself to support a bill for public health improvement. In January, it was agreed that there should be a petition to the legislature in favour of sanitary measures: in April a petition was adopted in opposition to the Health of Towns bill, and in May a petition was signed in favour of the measure. Hence Noake's reference to local agitation! The bill passed in June 1848, and in October 1848 the Council resolved that it was desirable to bring the provisions of the Act into operation within the City of Worcester. So Mr George Clark, Government Inspector, gave notice that he would make the necessary enquiries as to the sanitary condition of the city. From the Nuisance Reports for 1848 I selected the following specimens. 'Dolday: 61 houses, 14 privies, 9 open cesspools and 1 partly roofed — 6 pumps: one pump with water tainted. "Many of the yards and privies are in a filthy condition, especially those belonging to lodging houses. The leakage from one cesspool leaks through the wall and runs down the yard. The one partly covered cesspool with side openings is 3 feet from a pump." I chose the second for its location, Owner Featherstone's yard, the site of the water engine: "3 houses, 2 privies, 1 open cesspool emptied every 3 months, 1 pump 11 feet from cesspool — water tainted: the inhabitants of this yard complain of stench from the cesspool." This was entitled a "Preliminary Inquiry into the Sewerage, Drainage and Supply of Water and Sanitary Condition of the Inhabitants of the City of Worcester" and did not mince words. "The real deficiencies of Worcester are most apparent in its sanitary condition" it stated, referring to the manure depot adjacent to the waterworks, and noting that there were 50—70 places in inferior parts of the town where epidemic, endemic and contagious diseases had of late been frequent. In Ann's Court (where cholera was to break out in 1854) 16 tenements had one privy — with a large open cesspool which was emptied twice a year, and which gave out a very offensive smell. Diarrhoea prevailed here, and there was much sickness and debility. The people brought much of their water supply from the Severn. Rents there were 2/6d per week. (This report gives graphic pictures of misery amongst the poor.) As regards the manure depot, which belonged to the Commissioners ... "It is proper also to mention that the principal depot for stable manure, road-scrapings and a considerable portion of night soil is upon a plot of land rather above and about 50 yards from the waterworks, the drain from which enters the Severn about 56 yards above the suction-pipe, while another very considerable culvert discharges the night soil from the infirmary and the county gaol, and enters the Severn about 100 yards below the suction-pipe". "The manure depot at Pitchcroft ... between the cattle market and margin of the town and the waterworks and the river ... at the time of my visit ... between 2000 and 3000 tons of manure chiefly from cesspools ... stacked about 12 feet high, separated from the waterworks by a road 20 yards wide and within reach of the river floods. The sale has of late been slack, and there is rather more than usual. The Commissioners have another smaller depot in Sidbury, on the canal. In both cases the roads about are without paving or metal, neither is the yard paved. The stench is very great." The reservoir at this time was a cast iron tank placed near the Cross on piers 18 feet high. It measures 40 feet x 12 feet, has 4 feet 2 inches water depth, and holds 13,000 gallons. The engine worked 12 hours daily except Sundays and supplied about one third of the population. It supplied each service pipe for an hour twice a week, in most cases in a yard outside the house. Clark noted that in the Infirmary, each ward had a self-acting water closet. There was an ample water supply: part rain water from the roof, part spring water pumped up by a small steam engine on site, and part supplied from the waterworks. Expenses estimated by Clark were: Water — with filtering reservoir near to the river at Pitchcroft — (hopefully with adjacent manure depot removed) — £21,750: sewerage £20,315. After reading this report, it is sad, but hardly surprising, to learn that 1849 saw another cholera epidemic in Worcester, with 43 deaths out of 89 cases. Acting upon Clark's report, the Central Board of Health made a provisional order for the application of the Public Health Act to Worcester. They could do this anywhere where mortality was higher than 23.0 per 1000 per annum. The average in Worcester for the previous seven years was 25.05 in 1000. A bill to confirm this provisional order received royal assent in August 1849. This was followed by panic in Worcester as to the likely expense that this would cause. Unrest was fostered for political ends. In order to apply the Act, the Public Health Committee reported that Worcester would need a clerk, treasurer, surveyor and medical officer of health: the first two were immediately appointed. A meeting of those hostile to the Act was called in September, and a "memorial" was sent to the Central Board, begging that the Act should not be applied to Worcester, as its mortality did not exceed 23 in 1,000. The Board replied that the Registrar General had certified that it was 25.05, and that they could not stop an Act of parliament. On November 16 1849, Edward Leader Williams was appointed surveyor under the Act by 23 votes to 8 given for Samuel Purchas (of whom more later). The Council were compelled to delay the appointment of a medical officer of health. Turberville concludes his excellent account of this period "At the municipal elections for 1850, parties were returned to the Council avowedly "to put a stop to the working of the Act altogether" but the dignity of the Council and its proceedings was not improved by this infusion of new blood. Up to the present time - 1852 - not a single step has been taken towards the practical application of the act in the city; but instead of that, the Council have been engaged in a dispute with the surveyor, whom they refused properly to remunerate - and thus they have involved the city in great expense to no sort of purpose. The Central Board have pronounced the Council to be entirely in the wrong; but there is reason to hope that wiser and more enlightened views, on a subject which involves the future prosperity of the city and the health and life of its inhabitants, will soon prevail." Between November 1849 and the Spring of 1850 there was concern about the drainage, the water works, the engine and the reservoir, until in May of 1850 Edward Leader Williams was instructed to report on the present state of affairs and on a future plan for them. He presented a drainage report in June 1850, to be followed in February 1851 by his Waterworks Report. Leader Williams stated in his report that there were 327 yards of old wooden mains in Foregate Street at that time. Mains were inadequate for their task, e.g. 3 inch sub mains in Dolday could not supply the whole of the street at one time, so the street had to be supplied in three lengths of 90 yards each. Newport Street was in a similar state. St John's, St Clement's, the Tything, Britannia and St George's Squares, the district between Britannia Square and Salt Lane (Castle Street), the Blockhouse and the other suburbs, were wholly unsupplied with soft water except where there were tanks for rain water, or the water carts charging a halfpenny for a bucket containing three gallons: barely one third of the district within the municipal boundary was supplied with water available in case of fire or suited to cooking or lavatory purposes, and although it was turned on in the High Street and one or two other of the principal streets sometimes three times a week, the mean time at each house was not three hours per week. Using unfiltered Severn water caused a lot of deposits and made cleaning out necessary. Well water in the city was very hard (see earlier) and wells were close to cesspits (also see earlier). Taps were kept turned on in readiness for the arrival of the supply, which caused waste. The intermittent supply caused people to draw more than they needed, which made mains and service pipes less durable, and could lead to stagnant water. "The Severn is a river fully charged with earthy matters ... the whole of the drainage from the manure yard near Pitchcroft runs into the river some 50 yards above the suction pipe of the pumping engine". "I hold it undesirable ever to take the waters of a navigable river such as the Severn for domestic use except in the absence of all other sources." This latter conclusion (in which Sir Charles Hastings supported him) was to prove significant, for it was the river which was ultimately to be taken as the source of supply, and, indeed, must have been the only alternative which in the long term was to proved feasible. The problem lay in acquiring the understanding and the means to treat the river water adequately once it had been taken for supply purposes. The alternative preferred by Leader Williams was to use the springs on the hills on the East side of the city, especially those near Upper Batten hall, Perry Wood and Ronks Wood. He claimed that these discharged over 200,000 gallons of water each 24 hours and that a city with 30,000 population would need 600,000 gallons each 24 hours (the supply at this time was 68,500 gallons daily). A pump well should be made near Harbour Hill, East of the railway station between the Newtown and Crowle roads at a level enabling the commanding of any nearby springs: the water should be pumped from there by steam power into a service reservoir capable of holding 1,888,000 gallons or three days' supply, upon the summit of Harbour Hill, over a hundred feet above the Cross, and high enough to command the upper floors of the House of Industry and the London Road houses. However, these plans were not to come to fruition. In a Council meeting on March 6 1851, Mr Pierpoint referred to the report as very able and important. The city was badly supplied with water, and injuriously with hard water, which made it necessary to use two teaspoonfuls of tea instead of one, and double the quantity of soap for washing. Printing the report for public reading would not sanction the carrying out of its proposals, but it should be read, and Mr Pierpoint would like to see a public meeting called. It was agreed to print and distribute 1000 copies. In an editorial on 3rd April 1851, Berrow's Worcester Journal detailed three opinions on the subject of Mr Williams's salary; (1) "the Whig-Radical centralizing party, who have been so anxious to saddle the city with unnecessary expense and... would have salaried a friend of theirs as an "Officer of Health".. propose to deal very liberally with the public purse and give Mr Williams £250 a year: (2) the economical and anti-centralizing party whose view it is to adopt a course less expensive to the rate-payers.. to fix Mr Williams's salary at £150 per annum and a donation of "~200 .. for extra past services': (3) a mixed party, also opposed to centralization, whose object it is to deal with the question with a rigid economy approaching to meanness, it is affirmed, without due reference to what may be most advantageous for the proper performance of the public service." The whole discussion, which was to occupy inches of column space in the paper over a period of over two years (mostly in its accounts of Council Meetings) appears complicated by personal and political issues and a kind of tension in some quarters amounting almost to hysteria. At the end of this editorial we read that Mr Williams's report was now before the rate-payers "but until the question of salary is settled, it is perfectly ridiculous to discuss the subject". When the Council met on 10th April 1851 it was decided to set up a Committee of Enquiry for looking into the best means of supplying the City of Worcester with water. After some discussion, it was agreed that this committee should have some members who where not councillors — the names of eight distinguished citizens were added, including Sir Charles Hastings. Berrow's Worcester Journal felt that he should resign his office and then sue the Local Board for his money. On August 1, Leader Williams wrote to the Town Clerk "I herewith send you my account against the Town Council and Local Board of Health, and I shall be obliged by a cheque for the amount". The amount was £19551310. The Worcester journal on August 7 rejoiced in publishing the itemised bill for this. One of the points emerging in subsequent Council discussion was that at the time of Mr Williams's appointment, neither he nor Mr Purchas was spoken to directly on the question of salary, but indications of what might be acceptable were made by Councillors on their behalf. There was anxiety about the legal proceedings which were now to ensue with Mr Williams, and a committee was formed to deal with it and with arranging a settlement if possible. A public meeting, called in response to a requisition signed by 214 inhabitants, for taking their opinion on the legal proceedings and passing any necessary resolutions, was recorded in the Journal of 27 November 1851. It was a very lively meeting. I quote Mr Alcock: "Mr Williams could not be considered a first— rate engineer, like Sir George Stephenson — or even a second or third rate one — and so could have no pretension to charge for his services as he had done: if the citizens wanted an improved system of drainage or water supply they should call in to their assistance the services of a really scientific man, and not those of a mere quack and pretender who had studied deceit and practised delusion, and afterwards brought in a monstrous bill for them to pay (Vehement Applause)". In such an atmosphere and amid such excitement there was little hope for the Williams report. (The problem over salary was to be resolved, after recourse to law, by a settlement for £655.) In December 1851 the Worcester Journal quoted the evidence which Edward Leader Williams had given to the Select Committee on the Metropolis Water Bill. He spoke of the role and powers of the Commissioners: there would be 500 to 1000 people in Worcester qualified to exercise this role, but a normal attendance of 10 to 12 rising to 40 to 60 when there was an appointment to be made. From this evidence the Commissioners are revealed as a small group (in practice) interested in retaining their status, which was lost to them under the Public Health Act: they had never exercised their power to borrow on a mortgage of the rates to improve facilities for the city. Where complaint about the supply had been made, minutes read "that this report should be taken into consideration at the next meeting" and that was as far as it went. Meanwhile, the Commissioners acted as a block to any private initiative in the matter: pledges were exacted from those standing for the municipal elections for 1850 that there would be no outlay in such a cause, and that the root of this feeling lay with the owners of small tenements, whose anxieties and misstatements were aided and abetted by others from political motives. A memorable comment in Leader Williams's evidence was that the water in Worcester's supply was, at times of a fresh in the river, in colour very similar to the wainscot of the room where the Committee were, and was "a semi-fluid". Following the Council meeting of April 8, above, the meeting reported on May 6 accepted a tender for about 800 yards of cast iron piping. There had been no tender for repairing the engine, and Mr Jones, an engine maker of Birmingham, had been written to and asked to inspect it and estimate the cost of repair, which he put at £80/16/0. Also at this time the Council petitioned the Central Board of Health for the removal of Edward Leader Williams as Surveyor under the Act (which was refused). In their letter refusing this dismissal, the Secretary wrote of the "lanes and alleys of Worcester — the hot-bed of pestilence — undrained, uncleansed and destitute both of pure air and pure water" and concluded that it was hoped that the lives and health of the people should not be sacrificed to "certain vague personal objections affecting an officer against whose zeal, capacity and conduct in office they can allege nothing'' . The Council had also been notified at this time that the costs of the Board or their Superintendent Inspector for the application of the Public Health Act to Worcester, to be paid out of a general district rate, were £144/7/0. This included the visit of the Inspector (George Clark), his report, maps, expenses etc.. By August of 1852, the Council had passed a resolution saying that Edward Leader Williams, who had ceased to occupy the office in the Guildhall provided for the Surveyor, and refused to accept salary voted to him, had in effect voided his appointment. An editorial in the Journal referred to the Public Health Act," however advantageous its objects, being founded on such erroneous political principles that it cannot possibly remain the law of the land, without itself becoming a greater evil than the nuisances it would sweep away". In September 1852, a memorial from about 670 ratepayers and owners of property was received by the Town Council, asking that the city be drained and supplied with water. The Council decided that this should be forwarded to the General Board of Health, and that they should be asked to "remove the difficulty which prevented the Local Board of Health from carrying out sanitary improvements, by confirming the dismissal of the Surveyor". By such means was that issue used by the municipal authorities as a way to block any action in the matter. This request too was dismissed by the General Board, making the point that the excuse for inaction was hardly justifiable. In October a statement made by Leader Williams and his solicitor before a Commissioner of Oaths appeared in the Worcester Journal. It described the agitation in Worcester over expenditure under the Public Health Act, adding that particulars of Leader Williams's claim had been published in the Journal of August 7 and widely publicised as an advertisement in the city (this allegedly at Council expense) so prejudicing the citizens against Leader Williams. It would therefore be impossible to obtain a fair trial of the action in Worcester. Several weeks later correspondence between Mr Williams and the Mayor appeared in the paper — this over the Mayor allegedly have said that levels measured by Mr Williams (in fact, by his son) on the Worcester and Birmingham Canal were inaccurate. The paper noted that Southampton had borrowed nearly £90,000 for drainage and waterworks, and urged that what was requisite should be done first, and then comforts and luxuries should be added if they could be afforded: "let us have the Public Health Act — without the Central Board". At the beginning of December 1852 the Journal reader learnt that Leader Williams had written to the General Board, alleging that the Local Board had been entering into illegal contracts. The General Board reminded the Local Board of some of the embarrassing consequences of this, should such allegations prove to be true. It was only too clear that relationships were breaking down. Later that month Leader Williams gave a public lecture on the "Sources of Water Supply" at the Natural History Room in Foregate Street. Sir Charles Hastings presided. During this lecture he spoke of a river as "but a collection of the drainage of the country going to the sea to be sweetened"... "Go to the hills for water and not to the valleys". He referred to great aqueducts of Roman times. Concluding, he said that it was our duty to afford the poor that greatest of blessings — an abundant supply of water. As regards Worcester, he continued to advocate the use of spring water, and spoke of a particular spring at Ronkswood which he felt to be the best source. In March 1853 the Local Board of Health petitioned the Commons to appoint a Select Committee to enquire into the workings of the Public Health Act 1848 .... and as to the proceedings and correspondence of the General Board of Health; and as to the results of the application of the said Act . . .": this was printed, and a copy sent to every Local Board of Health in England and Wales, with a letter from the Town Clerk, requesting co-operation through Members of Parliament. This petition, and another against the Public Health Act — prepared the autumn before and signed by more than 2000 citizens were presented to Parliament later that month. Deputations both against and in favour of the Act travelled to London, where they met Sir William Molesworth of the Board of Health. The Tory Worcester Journal referred in scathing terms to the visit of the "clique" to London (i.e. a Whig group, led by Alderman Edward Evans, an old friend and political colleague of Leader Williams) and to the account given of this visit in the Worcester Herald (their Whig rival paper). "We, also, know something of what passed". The paper claimed that Mr Laslett (one of Worcester's MPs) was given an insulting reception by "Evans & Co." at a London inn — this because he had supported the views of constituents against the Act - that Mr Evans had lost his temper with Sir William Molesworth and attacked Mr Laslett in Sir William's presence. Worcester's other MP. Mr Ricardo "acting under the influence of the clique, endeavoured to persuade his colleague to throw his constituents overboard." Sir William Molesworth, disapproving of the wrangle, was then said to have bowed the deputation out. Mr Evans was alleged to have told Sir William the constituencies which elected the town councillors of Worcester were bought up by pints of ale. The Journal continued to assert in opposition to "the clique" that the larger part of the citizens of Worcester did not want the Act applied in the city, as the one-tenth of the ratepayers required to petition for it had never been found. At this time also there had been discussion of the Public Health Act in parliament, Worcester's case had been spoken of, and Mr Laslett, in seconding the speaker had said that unless the government considered the matter, he would move for a Committee to enquire into the operation of the Public Health Act in Worcester. In a Board of Health paper dated 2nd September 1853, it was announced that the free lending of the Board of Health's horse and cart for the removal of night soil was to be discontinued, and charged as follows: 1/— per hour for horse etc., 4d per hour for the night soil cart and 4d per hour for the man to attend: total 1/8d: such to be allowed only when every other means have failed to get the soil or other offensive matter removed. This notice was signed John Chetwin, Street Superintendent and Inspector of Nuisances. This was a miserably short-sighted move. it coincided with a further cholera scare, as cholera appeared in Britain again (at Newcastle and Gateshead in September 1853) but it did not this time arrive in Worcester until the Autumn of 1854. During 1852 there had been some question of the Manure Deposit Yard near the Engine House being given up for the erection of swimming baths, and later that year the Water Streets and Sewerage Committee were in negotiation for one or more other sites. In July it was resolved "That the Six Masters be requested to raise the yard at the South of the Water Works so as to make it suitable for a deposit yard, and let it to the Local Board of Health": in March 1853 "Mr Chetwin (the Inspector of Nuisances) was to take Privy Manure to Mr Lightwood's field near the Severn Bridge at 1/8d per load until further orders". Every site used or discussed in this context happens to be in nice proximity to the waterworks, but at the beginning of October 1853 Mr Coucher, one of the Councillors, agreed to the use of one of his fields adjoining the Bromyard Road for the depositing of night soil, at a fee of £21210, "until all apprehension of the Asiatic Cholera had passed away". By 31 October he declined to allow any more to be put there: some was to go to Mr Price of the Three Tuns Inn. The disposal problem was a serious one in the context of public health. At a special meeting of the Local Board of Health in October 1853, a petition was received from the doctors of Worcester, led by Sir Charles Hastings and Jonas Maiden, urging the removal of nuisances and the cleansing of the town without delay. Alderman Lucy pleaded that their hands were tied by the operation of the Public Health Act, by the situation of Edward Leader Williams and the influence of his friends, and by the need to find the money themselves. Dr Maiden, in reply, explained that one of the regulations of the General Board made provision that if there was delay or default by those responsible for removing nuisances or cleansing, the Guardians of such Union or parish or the Overseers and all such persons having legal authority with such parish should cause the same nuisances etc. to be removed. He said that if the Board were powerless, the doctors would appeal to other authorities, as there could be no delay. The Town Clerk eventually agreed that the Board had powers to do all that was required, and resolutions were put in hand. (The citizens of Worcester would have had occasion to be grateful to Dr Maiden for his intervention in this discussion, had they known of it.) The cholera scare of 1853 was also the occasion of Edward Leader Williams's resignation as Surveyor under the Public Health Act. Within a week of the doctors' petition, above, it was claimed in the Town Council that Mr Williams and his friends had obstructed the sanitary improvement of the city by continual opposition to improvements, that at the time of their being at the head of affairs no extraordinary effort to improve its state had been made, that if Mr Williams' plan for the water supply had been adopted Worcester would have been without water (the spring at Ronkswood, his preferred source, had failed the previous year), and that it was now agreed that the tubular system of drainage, which he had advocated, was not a good system. During much of the period 1849-1851 the more routine tasks of the Surveyor were not being carried out, and Mr Purchas, the unsuccessful applicant for the Public Health Act job, was appointed as City Surveyor. Indeed, at the time of the latter's appointment, in May 1851, it was said at one of the Council meetings that there were no less than one hundred threatened indictments for nuisances in various parts of the city — a worrying state of affairs. The Local Board of Health could not themselves dismiss Leader Williams without permission from the General Board of Health, which they refused to give — on the grounds that he had done nothing amiss, and that the Local Board's dislike of him was political. (He would also have had the disadvantages of having been in trade, not being from Worcester, being an ardent member of Angel Street Presbyterian Church, and being a man whose ability was in advance of his opportunities: a man before his time, Secretary of the Worcester Athenaeum and friend of John Constable.) The local inability to dismiss officers fuelled great emotion about centralised versus local government (cf. Matthew Pierpoint's puppet demonstration, above.) One of the memorable outbursts from members of the public at the November 1851 public meeting, recorded by Berrow's Worcester Journal, was "Throw him in the river!" — "He has not made it deep enough!" Reading through the Journal one wonders how this deadlock will resolve itself. In a letter to the Whig paper, the Worcester Herald, on October 8 1853, Leader Williams offered to resign; he said, in a reference to the Council meeting reported above, that some felt that he and his friends were the only obstructions to sanitary regulations — this, he added, either meant that there had been a misapprehension, or that a "gratifying change" had come over the Council. He would put it the matter to the test: "let the Local Board of Health immediately pass a resolution (in which not less than two thirds of the members of that body shall concur) in terms satisfactory to the doctors of the city, pledging the Board to lay down .... a complete system of drains and sewers, to provide for all, both poor and rich, a full and constant supply of wholesome soft water, and to carry out the other sanitary provisions of the Public Health Act, in their integrity, and upon their passing such resolution, I hereby pledge myself to waive all personal feeling and at once to resign my office of Surveyor under the said Act". If, on the other hand, there was to be water supply which was a tinkered-with version of current arrangements, he would remain in office to protect the public. This appeared to be blackmail on the one hand and nobility on the other: Leader Williams seems to have been a man of strong principle, although obdurate and difficult at times: however, in the climate of panic over cholera prevailing at the time, it was successful. On 29 October 1853 the Journal carried an editorial which vilified the "clique" in colourful and (by today's standards) in what we would imagine to be libellous language. ("A clique of "Liberal" individuals desirous of obtaining private ends... doing their utmost, in a very malignant spirit, to injure the city in its pecuniary interests..., agents of the Central Board, which supported them in all their "nefarious and deceitful" proceedings".) Another bone of contention at this time was the widening of Lowesmoor Bridge: the Council had tried to include the rate for this under the Public Health Act: the "learned but not over-judicious Recorder" when appealed to by the clique, had disallowed this. I shall quote a portion of this editorial: "In short, every mean-spirited method of obstruction and annoyance is hit upon to force their "Surveyor" on the ratepayers, and obtrude on them selfish schemes. They now threaten an application to the Court of Queen's Bench "to enforce (!) (sic) the requisite drainage and water supply of this city! ... In the meanwhile, the Local Board have been doing all they can (although constantly obstructed by these tacticians) to carry out the wholesome portions of the Act, but they are more than ever determined not to employ an insolent public servant like Mr Williams, or to involve the community in lavish expenditure, without having the control of their own actions, and something like an equitable assessment for the Local Rates". On 11 November 1853 the City Surveyor, Mr Purchas, reported that the crank of the waterworks engine was broken. A new one was to be put in. On December 10th the Journal carried an account of a Council Meeting at which Alderman Hughes proposed that the Council should lay down a drainage system and provide an adequate supply of wholesome water for the city, and carry out the provisions of the Public Health Act, subject to such alterations as Parliament might make for the amendment of provisions of the Act which were in the opinion of the Board opposed to local self-government. He said that this was in response to public opinion, rather than to Mr Williams's letter. An amendment designed to delay affairs until they had a Surveyor was defeated. Alderman Hughes' resolution was carried 25:9 — there were 12 members absent, so 7 were needed to make up the "two-thirds": Alderman Hughes remarked that if Mr Williams wished to reinstate himself in the favour of his fellow citizens, he would not take advantage of the deficiency in numbers, but would resign. In December the resolution was submitted to the doctors of the city, and agreed in principle: Leader Williams when approached again, agreed that he did not wish to object on technical details, and formally resigned as Surveyor. He was paid £50: arrears of salary for two and a half years as Surveyor under the Public Health Act. Thus ended the period when he had been the focus for a multitude of civic tensions: party political, class, centralisation versus local government, the whole leavened no doubt by issues of personality, both his own and the personalities of those who supported him and those who so bitterly vented their antagonism and dislike. The Minutes of Proceedings of the Institution of Civil Engineers carried an obituary of Edward Leader Williams after his death in 1879, and quoted from the Worcestershire Chronicle: "Whenever he took up a thing he conducted it with undeviating patience and unremitting steadfastness to the desired end, and never abated one jot of heart or hope under a concurrence of hostile circumstances which would have disheartened a less resolute mind and discomfited anyone not gifted with a well-grounded confidence in his own abilities and powers, and a firm resolution never to stop short on this side of success. He never gave in or knocked under, but bore up manfully through all contradictions and adversities, and by persistent encounter, overcame opposition and forced it to give way". This is not the most comfortable of obituaries (particularly as it is written from a favourable viewpoint) though from it we may draw a shrewd impression of him. He was a notable character in Worcester, and I chose my title for this work from the public lecture which he gave on water supplies, "that greatest of blessings". The Board of Health subsequently briefed Mr Hawkesley, from London, to plan for a new water works, but due to his dilatoriness the Barbourne Works did not open until 1858, and cholera returned to the city in 1854. From 26th September 1853 the Streets, Water and Sewerage Committee met daily, until 24th October, when it met on Monday, Wednesday and Friday evenings. Temporary extra Inspectors of Nuisances were appointed, and the city divided into sections for inspection. All nuisances and accumulations of filth were to be removed. In February 1854 Mr Purchas reported that the waterworks engine was now better than for many years, pumping over 200 gallons per minute, 75% more than had been done with the old 5.5" mains. By April 1854 Hawkesley had still not appeared in Worcester, and the Town Clerk was requested to ask when he could visit Worcester: if there was no reply, the Council was to seek help elsewhere. On 20th May it was reported that Hawkesley had been down and toured the city: on 8th July there was still no sign of the report. By August, the Town Clerk had seen Hawkesley in London, and there was increasing anxiety about the report. There was also cholera in London. On 9th October 1854 Mr Woodward, one of the Medical Officers of the Worcester Union, stated that Epidemic Cholera was on the increase in the neighbourhood of Ann's Entry, Newport Street, Worcester. Two leather hose were bought for washing down courts (areas between densely packed groups of houses). By 16th October there were several cases of cholera in Dolday, and there had been several deaths. The City Surveyor, Mr Purchas, was asked to look at drains and their outlet to the river. On 28th October a Dr Turley gave a public lecture on cholera, which was well attended. The November 4th issue of the Worcester Journal recorded that there had been seven deaths since the previous week's publication, five of them in Diglis Street. Mr Woodward had treated 36 cholera cases and 59 of diarrhoea, Mr Hill 10 of diarrhoea and 4 of cholera (3 deaths): Mr Sheppard, the hospital surgeon said that there were 10 cases in the hospitals, and that there had been 1 death. The Worcester Journal of November 11 1854 reported the installation of the new Mayor, Mr John Goodwin of All Saints Ward (a special peal of bells was rung at All Saints Church to mark the first Mayor from this ward). The paper recorded that he created a sensation by announcing that he had consulted the church registers, which showed that there had been 40 deaths in the All Saints parish during the previous month, out of a population of 2,000. Both this account and the paper's treatment of the epidemic show an impersonal quality by present day standards, for instance, no names and addresses of victims: even the Mayor discovers the situation by reference to the church registers. The readership of the Worcester Journal shuddered at the situation and tried to keep it at one remove — it was the poor in the crowded courts who were the principal sufferers. The November 18 issue of the journal reported that there were no fresh cases of cholera that week. In October 1854 a letter from the Rector and Curate of All Saints Church was sent to the General Board of Health in London. There had been numerous deaths from cholera and diarrhoea in All Saints parish, they were alarmed, and urged that the "present neglected and defective state of the sewerage throughout the whole city", which was the chief cause of the cholera in All Saints, should be urgently remedied. This caused the General Board to remind the Local Board of its obligations - and led to an infuriatingly sarcastic editorial in the Worcester Journal on 4 November 1854. This report, presented to the Committee at this time, came out against the use of springs for the water supply: the quantity would be insufficient and the water was too hard. The alternatives were to use the Severn in Pope Iron Meadow and carry a suction pipe across the Barbourne Brook, or to use the water of the River Teme, which was of better quality. Hawkesley recommended subsiding tanks and sand filters, and a reservoir on Rainbow Hill in Alderman Lewis's fields, with a pair of engines about 20 hp. each with double action pumps. This scheme would cost about £21,200 (p2,600 extra if Teme water was used). In November/December 1854 an agreement was reached with the Railway Company: the offer was that they were to be supplied with water at 3d per 1000 gallons on condition that a minimum of 50,000 gallons daily be paid for. The company said that if a scheme was not completed quickly they would make their own works for supply. In January 1855 it was resolved by the Streets, Water & Sewerage Committee that Mr Purchas was to ascertain from Mr Hawkesley the quantity of land required for proposed water works at the Teme and at the Severn and for the tanks at Rainbow Hill, and that the Town Clerk should apply to the parties to whom the land belonged, to know upon what terms the land could be had. Also at this time the Council agreed that Hawkesley's report should be adopted. The decision on the location of the works was to await a new Government Measure, the effects of which on the Board of Health were awaited. Hawkesley was to be appointed Consultant, and it was noted that in the Act proposed for 1855, the Local Board could dismiss its own officials. One of the City Councillors, Mr Longmore, was quoted in the Worcester Journal for 10th February 1855 "The late epidemic which had cost the city £600 might not have broken out at all but for the state of Dolday." In March 1855, Mr Purchas reported that the waterworks engine had been stopped for a fortnight, and there had been no supply, due to the recent frosts. The Water, Streets and Sewerage Committee heard that an approach had been made to Mr Laslett to find out if he would sell his land at Barbourne for the waterworks site. He had said that he could not sell it. In fact there appeared to be a legal difficulty, as there was some question about his title to the land. In the event this was cleared up. Documents relating to the issue are still in Worcester Record Office. It was ironical that Mr Laslett, (mentioned earlier), one of Worcester's MPs who had earlier spoken against the Public Health Act, now potentially stood to profit by its implementation: this did not escape public notice. The Committee visited Powick to look at the site where the waterworks would be situated if it was decided to use the water of the River Teme. The proprietor of Powick Mills said that any application to purchase land there should be made to his solicitor. On 11 April 1855 the motion was finally carried to use water from the Severn rather than the Teme. Meanwhile it was proposed once again to investigate the site at Barbourne. Mr Purchas was asked on 18 June to treat with the surveyors of Mr Laslett (despite the earlier refusal) and Mr (Alderman) Lewis as to the value of their land which was required for purchase at Pope Iron Field (for the waterworks) and Rainbow Hill (for the reservoir). Mr Laslett asked a price of £400 per acre, and Mr Lewis £850 for one acre of his land, subject to the Council paying all expenses and building a wall 8 feet high on the lower side of the land if needed. The Committee resolved to buy two acres and three perches of land at Pope Iron Field at £400 per acre from Mr Laslett and one acre from Mr Lewis on the above terms. On 4 June 1856 the Town Clerk was requested to write to Mr Hawkesley asking what would be the best way to proceed in carrying out the works for sewerage and water supply. (Two years have already passed since his Report, and, to the modern eye, the most irritating factor of this period is the slow pace of progress with their scheme.) Hawkesley now completed his specifications, asked for tenders, and agreed with Councillors that Samuel Purchas was an appropriate person to appoint as Surveyor under the Public Health Act (that post had been standing vacant since Leader Williams's resignation) so that the works about to proceed could do so with official sanction. His salary was to be £150 per year, and he was not to charge for additional services: they were not risking another "little bill". The Council then proceeded with plans to borrow money for the work. The Atlas Assurance Co. agreed to advance £20,000 at 5% interest, to be paid back in thirty yearly instalments. In June 1857 they were asked to advance another £10,000. By January 1857 there were still delays on the contract for the sewerage works, but the draft advertisements for tenders for the waterworks and reservoir were prepared. It was recommended that Mr Purchas be General Superintendent and Assistant Engineer of the Water and Sewerage Works (his salary was to be £187/10/0); Mr Henry Lucy of Cheltenham was appointed Inspector of the Engine and Boiler Houses, Filter Beds, Reservoir etc. at three guineas per week, with a foreman under him at thirty shillings per week. Thomas Davis of Halesowen was to be Inspector of the Sewerage Works at two guineas per week from 1 March 1857. On 5th March 1857 the Committee fixed that the foundation of the waterworks would be laid on 17th March. Members of the Corporation were to attend, and dine later at the Hop Market Hotel with the contractors and any other guests who wished to do so. A silver trowel was purchased for the ceremonial opening, and a fly requisitioned to take guests to the site. They were to meet at Pope Iron House at 2.l5 pm and form a procession to the waterworks. It will have been a great day. (Was Leader Williams present, I wonder?) A box was inserted into the foundation stone containing copies of newspapers of the day and items of local manufacture. Back at the Pope Iron, those present drank champagne to the undertaking's success. The workmen were treated with a hundredweight of bread, fifty pounds of cheese, two kilderkins of ale and a pound and a half of tobacco. In July of that year Alderman Lewis asked if he could have a door with access to the top of the reservoir on his land, for his pleasure and for the protection of the public property. This was allowed. He was to pay the Council 6d a year as an acknowledgement. In April 1858 Hawkesley wrote to the Committee that he had visited Worcester, and found the waterworks working well. The sewerage works would be ready in about a month. It must have been a relief to have the system working, but clearly the problems were not entirely solved. In 1857 Sir Charles Hastings had written, in the Transactions of the National Association for the Promotion of Social Science, that the use of rivers for draining sewerage into them was a dangerous practice, especially where the river was to be used for a water supply. "At Worcester these (filtration) arrangements are very good, but it is questionable whether water rendered very impure by towns can be thereby restored to its pristine purity". When the Diseases Notification Act came into force in 1890, it was realised that the incidence of typhoid, up to 150 per 100,000 in Worcester, was higher than normal. (This was possibly not unconnected with the earlier flooding.) Much discussion amongst Councillors at this time ended in the decision (by a small majority) to retain the Severn as the source of supply, and instructions were given to Mr Purchas for the building of three additional filters which were completed in 1894. A pleasing drop in typhoid cases ensued, referred to by the City Engineer as an "extraordinary reduction . In 1895 another reservoir was completed at Elbury Hill, and electric pumps were installed: these pumps ran for twenty years until the supply changed from single phase to multiphase. After the First World War, two new filters and two new reservoirs were added, until by 1925 the area of the works was about 7.75 acres. In 1929 in "Wells and Springs of Worcestershire" by L Richardson, County Analyst Cecil Duncan advised on how to make wells safe; Richardson had commented that few were lined, and that the main trouble with the Keuper Marl was its liability to contamination by surface drainage. The advice given was similar to that given in Third World countries today, as in projects carried out by the charity Wateraid. Many areas of Worcestershire still had unsafe water in 1929, for example, in Cropthorne 86.6% of well water was dangerous to health. In St John's in Bedwardine County parish of 3,348 acres on Keuper Marl the people were dependent on wells, except for one house which had Worcester City water laid on. In St Peter the Great County, Norton Barracks and about twenty houses were supplied from the City Waterworks, otherwise wells were used; St Martin County area also was dependent on wells. R Taylor, the Chief Sanitary Inspector for Worcester, wrote: "As far as I know there are no more than 12 to 15 houses in the City without laid on City water. They are at Bilford Lane and Checketts Lane. Three breweries in the City use well water. So the expectation that every house will have water laid on is of very recent date. The history of the water supply in this century has been one of continuous expansion. The filtration system needed labour and ground space. Chemical purification systems require less labour and less space. In 1993 there were sixteen slow sand filters at the Barbourne works. There is a filtration system and a chemical treatment system operating alongside one another. Three of the original slow sand filters are still in use. The water from both treatment streams is then combined for its final fluoridation and pumping to the reservoir. Water taken in from the river is constantly monitored by computer. When the water is turbid, the chemical treatment system is given predominance. In the report which followed the contamination of Worcester's drinking water in April 1994, published in August of that year, it is noted that the closure of the Barbourne works has been brought forward to Spring 1995. It will be held on a care and maintenance basis. From that day the water supply will not be "owned" by the people of Worcester in the same way. I am including with this work some photographs taken at the Barbourne works in 1993, when Mr Jim Black kindly gave me a guided tour. The Barbourne works represent the fruit of much emotion, effort and money for the people of Worcester. The achievement of building them represented part of a learning curve for the city in the struggle to improve the quality of life despite much frustration, opposition and delay: to obtain for the people of Worcester "that greatest of blessings — an abundant supply of water". A History of the Worcester Royal Infirmary, W.H. McMenemy, Press Alliances 1947. Worcester Record Office, Nuisance Reports and Public Health Papers, Petitions, Deeds etc. Transactions Worcester Naturalists Club Vol 8 1923-31, pp 101-105 "Visit to the Worcester Waterworks, September 4, 1924" also pp 159-l65 of above "Early History of the Water Supply of Worcester" by B Brotherton FRGS and "The History of the Worcester Waterworks" by T Caink, ibid, pp l-65 ff. 1770 Act for Better Supplying the City of Worcester and the Liberties thereof with water"
The Severn River Exhibition, Worcester Public Library (material on waterworks), August 1993. Worcester Memory Lane, by Michael Grundy, published by Worcester Evening News. History of Worcester by Eaton, Worcester c1830. Worcester in the Nineteenth Century by T C Turberville, 1852. Henry Austin's report on "Sanatory Condition of the City of Worcester" 1847. Obituaries of Edward Leader Williams and his son, Sir Edward, supplied by the Royal Institution of Civil Engineers.